This coastal rustic living room showcases gray walls, a mix of modern and farmhouse furniture, rustic crate wall shelves and various coastal touches, including glass bottles and a big wood mirror. This room is big with a lot of windows and doorways, I feel like it took me a while to plan out the entire space and find exactly what I was looking for. I’m glad we took our time. I was determined to stick to the coastal rustic vibe in here instead of rushing to just finish the room. If you missed any of the earlier posts about this living room makeover, I have details on everything from planning the gallery wall to the furniture makeovers linked at the end of this post so be sure to hop over to anything you want to read more on. I also linked to allllll the pieces we used, from the couch down to the pillows and vases, at the end of this post if you’re looking for something! The new wall color is Agreeable Gray by Sherwin Williams. We love it. It really lightens up the room, and the curtains just flow and pop right off the wall color. Kalen surprised me with that gorgeous gray wood mirror above the mantel, which started the whole mantel design. I’d love to paint that brick white, but since we’re renting, I guess it’ll stay red. I’m always collecting bottles, I can’t help myself. They’re easy to find at thrift stores (or online sometimes), and they work for pretty much any surface you’re having trouble decorating. Just put some bottles on it and instant glam. The white bottle is actually an old whiskey bottle I painted with clay paint, you can see the tutorial for DIY faux concrete bottles here. That white and blue vase can be found here. The faux driftwood and bread bowl are fun coastal touches. We couldn’t resist that little dog when we found it at a local home decor store. It reminded us too much of Oakley. The silver lamps were actually put up on the mantel when we were unpacking just so we could turn some lights on in here When we started decorating, I left them. The mantel is long, and they add some nice height to the ends of it. Plus it’s nice to have some light over on that side of the room. I just love how green hydrangeas look when they’re dried. You can see how to dry hydrangeas here. It’s easy! I take them from my Grandmom’s garden every fall to use for decor throughout the year. I don’t really decorate with red anymore (you can see my easy tips for decorating in a new color scheme here – we swapped red for aqua). But that little wood crate with the red text is an exception. It says “Wisconsin cheese”, how could we pass that up!? It’s the perfect little coaster holder. These books are all great if you’re looking for something to read by the way. We didn’t want to buy anything huge for the wall thinking we wouldn’t be able to reuse anything big again in our Milwaukee house, so the gallery wall was perfect. We can always break up the grouping on different walls in the future so all of these pretty coastal pictures will be easy to reuse. I talked all about choosing artwork here and planning a gallery wall here, so check those out if you’re stumped. There’s so much pretty artwork out there, it can be hard to narrow it down! Kalen actually took that gorgeous green pier photo (upper left) on our vacation in Folly Beach. And this little farmhouse chest makeover. This chest was going to be our TV stand, and then I loved how it looked under these crates turned wall shelves, so I found the new (old?) TV stand on a local Facebook buying/selling page. These wood crates are a fun unique touch. I wanted to do something a bit different, and when I came across these, I knew they’d be perfect. We have our old pedestal table in the corner opposite the crate shelves and farmhouse chest. The rustic tray with rope handles is perfect for corralling pieces on top. Our old rustic ladder (aka blanket shelf) is perfect in that little corner behind the newly painted blue table. One other little small project in here was this DIY pillow. I took a pillow we got with our new bedspread that I didn’t like and made a new cover from two placemats from the clearance aisle. I just love the coffee table. The round wood is so pretty, and even though it’s dark when I was going for lighter furniture in here (because our couch is so dark), it was too good to not buy. Don’t you think?! Plus the legs are thin so it doesn’t take up a lot of visual space, which makes the dark okay in my book. That little modern side table by the chaise is a fun little touch, too. It’s easy to move around but still holds a drink and a book if you’re sitting over there. It’s a cozy little corner. Oakley is clearly a fan of the chaise corner, too. And that’s the coastal rustic living room! We’re excited to have such a big room knocked off the to-do list, although I’m sure I’ll be rearranging the mantel or the crate wood shelves sometime soon just for fun. Green pier photo, we took it ourselves in Folly Beach, SC. You can download it for free here. Curtain rod, but they’re not always available. These are similar. WANT A COPY OF THE GREEN PIER PHOTO? This looks beautiful Meg! 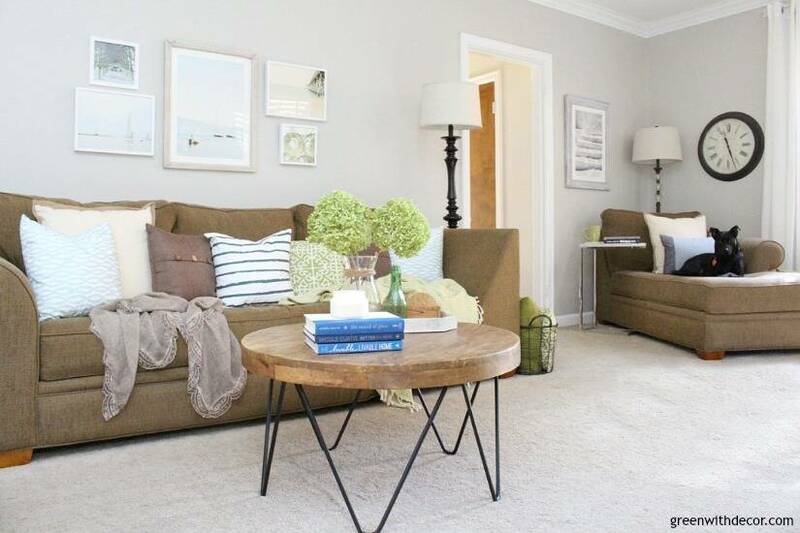 I especially love that coffee table! The wall color is perfect! Thanks, Roxanne! I really love the coffee table, too! Meg! Omg!!! This is beautiful! So cozy and inviting. Lovely photos too! Meg, you’ve done such an amazing job with this room! You brought your coastal rustic vision to life perfectly! This is a great coastal space! I pinned it to my coastal board. Thanks, Maria! We love it!